Through the 90’s Zanardi worked his way through the Formula One and CART racing in the US with varying levels of success. Early in the 90’s Zanardi had his first taste of Formula One at a test session for Paul Ricard, where he drove a Footwork. 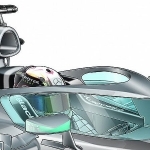 By the end of that year, he had begun his career in Formula One. Three starts for Jordan were his reward for a strong F3000 campaign. He eventually landed a contract with Lotus in 1993 racing along side Johnny Herbert and scored his only F1 point at the Brazilian Grand Prix. 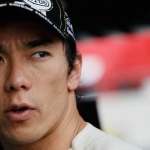 The remainder of his career at Lotus was plagued with injuries and pace issues with team performance. By the mid 90’s, Zanardi’s Formula One dreams seemed to be dissipating at which point he moved over to the CART Series in the United States in 1995. 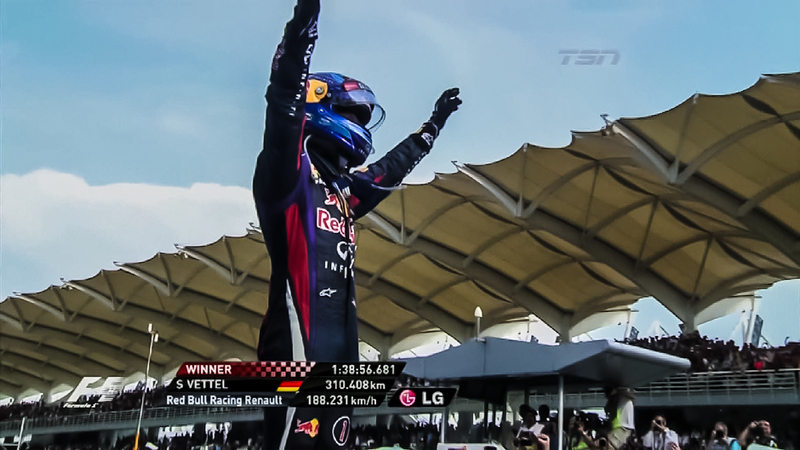 Even though he came from with some F1 experience, finding a team to sign was still no easy task. Eventually, Zanardi and team Chip Ganassi Racing came together and a contract was secured. What was regarded as a high risk signing for Ganassi turned out to be great success with Zanardi winning three races in his rookie season and five pole positions which earned him a third place finish in the 1995 year championship. This also earned Zanardi the Champ Racing Rookie of the Year. His successes continued with team Ganassi earning championships for both the 1997 and 1998 year. With success in CART, Zanardi tried his luck again in Formula One but only endured a 3 year stint with some promise in his performance which never came to fruition due in part to mechanical issues and some bad luck. At the end of his 3 year contract with Williams, Zanardi once again found his way back to CART. His official restart in CART came in 2001. 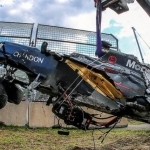 His performance for most of the season was lacking, but things looked to be turning around at the American Memorial race, but disaster struck in what is still called one of the most violent CART crashes. During the closing laps of the race, which Zanardi was leading, Zanardi was merging back onto the race track from the pit lane when he lost control and spun on the track into oncoming cars at race speed. Patrick Carpentier was coming right at Zanardi but fortunately was able to avoid an accident. However, Alex Tagliani was unable to avoid Zanardi and hit his car right behind the front wheel severing the nose of Zanardi’s car and severing both of his legs. Although open wheel racing career for Zanardi was effectively ended, this didn’t stop Zanardi from continuing a competitive motorsport racing. After being fitted with two prosthetic limbs, Zanardi began his gruelling battle back through intense rehabilitation. During this time in rehabilitation, Zanardi was determined to get himself back into physical form to once again race behind the wheels of a car. He fully understood the limitations of his prosthetics but would be determined to not let those limitations be his limitations. 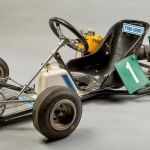 Investing in designing and producing the best prosthetics for motorsport application, Zanardi eventually was able to get back behind the wheel of a race car which was retrofitted with hand controls. He competed in his first racing in a modified touring car which allowed him to use his prosthetic legs to compete and eventually finished seventh in the race. He won his first WTCC series race in August of 2005, but decided to retire from WTCC in 2009. By this time, Zanardi began hand cycling, a form of paralympic cycling. He stated that his goal was to represent Italy in the 2012 Summer Paralympics. The competitive nature of Zanardi translated into everything he does. The drive and the determination of a champion could never be dwindled. In September 2011, Zanardi won his first medal, a silver medal, for senior international handcycling in the H4 category time trial at the UCI World Road Para-Cycling Championships. His performace put him in a position to represent his country at the 2012 London Paralympics where he brought home gold medals in the individual H4 time trial and the individual H4 road race, and a silver medal in the mixed H1-4 team relay. 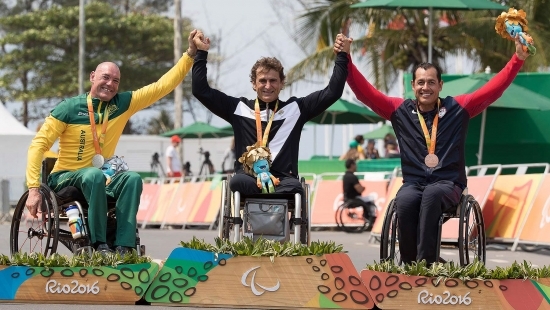 And now, Zanardi once again claims champion title bring home a gold medal in the H5 road time trial at the Rio Paralympics. This was a big win for Zanardi, not only for the fact that he has overcome the physical obstacles, but the date of this win marked the 15 year anniversary of his accident at the race which cost him his legs. So this is the story of Alex Zanardi. We know that Zanardi’s career is far from finished and the man will continue to evolve and be a champ at everything that he puts his mind to.